importance of conservation with a delegation of Chinese State Forestry Administration professionals visiting Brisbane. Hosted by Griffith University, the delegation of researchers, engineers, directors and professors was participating in an education and training program funded by the Chinese government. Wildlife Queensland Policies and Campaigns Manager, Des Boyland presented the group with a seminar on the active role the Society plays in the conservation of Queensland’s flora and fauna. A selection of Wildlife Australia magazines and WPSQ brochures on current programs was received with great interest, prompting a string of interesting questions from the group. As part of its biannual nest box monitoring program at Greenwood Lakes, Forestdale, the QGN also organised a field trip for the 14 delegates. The Greenwood Lakes site plays an important role in providing nesting opportunities for hollow-dependent animals within the urban bush land fringe in this area, where the fear of snake sightings within thick undergrowth was ever present among the group, providing some amusement for QGN volunteers assisting on the day. Each member of the party took the opportunity to use a pole-mounted monitoring camera and colour screen to view the contents of the nest boxes. Unfortunately, no glider species was identified at this particular monitoring event; however, brush tail possums, nesting material and a bird nest were all viewed excitedly via the monitoring system. All involved were particularly interested in the notions of habitat replacement, improvement and linkage through the use of nest boxes. 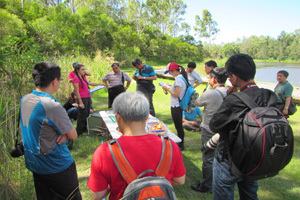 Wildlife Queensland looks forward to connecting and sharing through conservation again, hopefully next year, with a similar delegation of Chinese State Forestry professionals.